“The “dry” category of cider is developing the way the IPA category did in beer. When people started shifting away from larger mass-produced light lagers, they shifted to a style of beer that was typically produced by microbreweries — the IPA. Today, beer lovers may gravitate toward a specific variety of hops — like Mosaic or Citra or Simcoe — but when the IPA started to become popular, that wasn’t the case. Cider finds itself in a similar place. There isn’t as much brand recognition for different apples, so consumers are gravitating toward a style of cider production instead. “Dry” gives them a baseline to start with — something they can recognize. What does it mean to call a cider “dry”? Simply put, dry ciders are dry because they contain a lot less sugar. High amounts of sugar give beverages a thick, viscous or heavy feeling often described as wet. Saccharine just has a habit of making things feel thick in our mouths. On the other hand, less sugar means less thickness, less sweetness and more of that crisp, dry feeling. 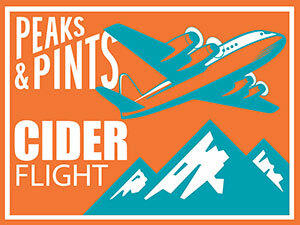 Today, Peaks and Pints offers a flight of dry cider that we call Peaks and Pints Monday Cider Flight 4.8.19: Dry Cider. By the way, please do keep in mind that even the world’s driest cider will completely and utterly soak your pants when spilled. Made primarily from culinary/table apples modern ciders are generally lower in tannin and higher in acidity. Seattle Cider delivers delicious modern ciders. With zero percent residual sugar, its Dry is a very dry cider in a classical style. The dryness doesn’t equate to a lack of flavor, however, as it still has a refined apple nature underlined by notes of stone fruits and a light tickle of lilac on the nose. It’s a cider that can stand alongside one of our roast beef sandwiches without losing the flavor battle. Oregonian Jeff and British Lydia launched Portland Cider Company in 2012 with the intent of marrying English cider traditions with the innovative Northwest micro-brewing culture. It all started from a desire to make the clean, dry cider Lynda grew to love in England, and Jeff yearned to find in Oregon. 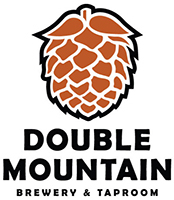 With their Hop’Rageous cider, they take a balanced dry cider made from 100 percent Northwest apples, infuse it with the fragrant Citra and Amarillo hops, and the result is equal notes of bitter hop and tangy citrus. Let’s face it. Baird & Dewar sounds more delicious than Trevor & Zeb. Trevor Baird is a highly regarded second generation farmer and fruit grower, whose peaches, cherries, and apples are used by many of Portland’s finest restaurants and breweries. 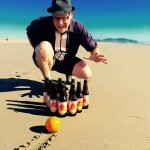 Zeb Dewar has made cider for more than 17 years, working for more than 10 years as a cellar hand, assistant winemaker, and harvest manager at premium Willamette Valley and Columbia Gorge wineries. He has been making cider from the apples grown at Baird Family Orchard for more than eight years. 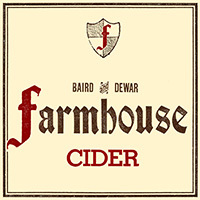 Baird & Dewar Farmhouse Cider was started slowly and quietly in the fall of 2011 as an extension of Zeb Dewar’s home cidermaking. Silvestra is a dry, unfiltered cider aged for a year in oak casks for a Brett-y nose followed by crisp and effervescent, mild green apple tartness. This was the first cider Eaglemount Winery & Cidery made from their 1883 Port Townsend homestead orchard. A blend of heirloom apples — White Pippin, Winesap, Gravenstein, Tolman Sweet, Jonathan, plus added structure from apples in their English and French cider orchard — Homestead Dry Cider is a light but complex dry sparkling cider with Gravenstein taking the lead with notes of white grape, olive, and chalky minerality.